343: "The Journey of the King"
Final Section: Ceremonial Battle arc (終（しゅう）章（しょう） 闘（たたか）いの儀（ぎ）編（へん） Shūshō Tataki no Gi-hen) is a story arc in the Yu-Gi-Oh! manga. 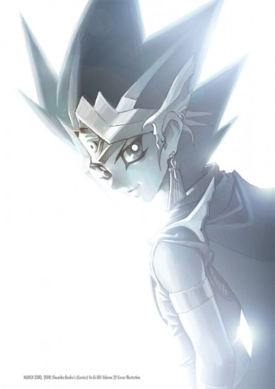 Atem faces Yugi in the Ceremonial Battle to determine if he is ready to pass on to the underworld. This arc contains the following chapters. The "subseries number" column contains the numbers the chapters used in their first English printing in Yu-Gi-Oh! Millennium World. Yugi and Atem conclude their Duel, determining whether or not Atem can pass on to the afterlife. #001 "The Puzzle of the Gods"
#007 "The Face of Truth"
#009 "The Cards with Teeth (Part 1)"
#010 "The Cards with Teeth (Part 2)"
#011 "The Wild Gang (Part 1)"
#012 "The Wild Gang (Part 2)"
#013 "The Man from Egypt (Part 1)"
#014 "The Man from Egypt (Part 2)"
#022 "American Hero (Part 1)"
#023 "American Hero (Part 2)"
#030 "Don't Make a Sound!" #038 "The Terror of Blue-Eyes!!" #040 "A Piece of His Heart"
#043 "Monster Fight!! (Part 1)"
#044 "Monster Fight!! (Part 2)"
#046 "The Evil Dragon Cards (Part 1)"
#047 "The Evil Dragon Cards (Part 2)"
#048 "Jonouchi!! Soul Battle!! (Part 1)"
#049 "Jonouchi!! Soul Battle!! (Part 2)"
#050 "Millennium Enemy 1: The Mysterious Transfer Student"
#051 "Millennium Enemy 2: Monster World"
#052 "Millennium Enemy 3: The Fumble of Doom"
#053 "Millennium Enemy 4: Role-Playing Miniatures"
#054 "Millennium Enemy 5: Stop the Run of Criticals!" #055 "Millennium Enemy 6: The Traps of Zorc Castle"
#056 "Millennium Enemy 7: I'll Fight Too!" #057 "Millennium Enemy 8: Fight! Fight!!" #058 "Millennium Enemy 9: The White Wizard Bakura"
#059 "Millennium Enemy 10: The Last Die Roll"
#061 "Don't Draw That Card!!" #064 "Fate on the High Seas!!" #065 "Let the Duel Begin!" #067 "The Ultimate Great Moth"
#070 "Things that Don't Change"
#071 "The Scourge of the Sea"
#072 "Attack from the Deep"
#075 "The Cards Bare Their Teeth"
#084 "A Storm in the Kingdom"
#087 "The Terror of Pegasus!" #090 "Call of the Grave"
#091 "Death to the Undead!" #094 "The Magic of the Maze!" #095 "The Terror of the Dungeon"
#106 "Another Kind of Courage"
#108 "The First Stages of Fear!" #109 "The Deadly Duelist King!" #112 "The Eve of Battle"
#113 "Stealth in the Night!" #117 "Running on the Edge!" #121 "Rise of the Machines"
#128 "The Downfall of Toon World"
#132 "The Tragic Tale of the Millennium Eye"
#137 "The Path of Darkness!" #141 "The Calling of the Powers"
#144 "The Room of Revenge"
#148 "The God of the Obelisk"
#154 "To Destroy a Deck"
#165 "Imprints of a Memory"
#166 "Eyes that See the Future"
#171 "Fight of the Millennium!" #174 "The Combo of God!!" #180 "Return of the Sea Scourge"
#183 "The Reason for Dueling"
#191 "The Place of Destiny"
#194 "The Card of Pride"
#196 "The Last Piece of the Puzzle"
#197 "One Card of Life and Death!" #198 "Friends till the End"
#200 "The Courage to See"
#204 "The Thing in the Dark"
#208 "The Line of Fire"
#210 "The Trap in the Temple!" #212 "Those Who Inherit the Duel"
#215 "The Proof of the Clan!" #221 "Descent of the God!" #222 "The Rise of Ra!" #223 "The Depths of Darkness!" #224 "The Future is Now"
#228 "The Death of Obelisk?" #229 "The Eyes of Memory"
#231 "Out of the Past"
#232 "The Clan of Darkness!" #233 "Duel in the Dark!" #236 "The Dark God is Born!" #237 "The Eve of Battle"
#238 "The Dawn of Battle!" #241 "Eyes on the Target!" #244 "The Hymn of Hell"
#245 "The Darkness of Death!" #250 "Light from the Future!!" #251 "A Battle to Tear the Skies Asunder!" #254 "Secret Plan to Call God!" #258 "The Servants Surpass God"
#263 "The Monster of Victory or Defeat"
#265 "Showdown in the Heavens!" #266 "The Quick Attack Trap"
#273 "God's Sword, God's Shield"
#274 "Attack from the Darkness!" #275 "One Point of Life!" #276 "Than Curse the Darkness"
#277 "The End of Alcatraz"
#281 "Mystery of the the Artifact!!" #283 "The Six Chosen Priests"
#285 "Bakura, King of Thieves"
#288 "In the Name of the Gods"
#290 "Search for the Pharaoh's Name!" #295 "Tears in the Nile"
#298 "Out of the Darkness"
#299 "Assault on the Palace!" #301 "Divine Light, Divine Shadow"
#302 "Surprise Attack! Power Attack!" #303 "To Pierce the Darkness!" #304 "The Summoning of Ra!" #308 "The Birth of the Millennium Items!!" #309 "Ripples in the Shadows"
#310 "The White Dragon Awakes!" #311 "The Vessel of the White Dragon"
#313 "The Village of Ghosts!!" #317 "Return of the Priests!" #318 "Together Against the Darkness!" #319 "The Pawns of Memory!" #320 "The Ultimate Shadow RPG!" #321 "The Dark God Awakes!" #324 "Battle in the Shrine!" #327 "I Won't Give Up!!" #328 "The End of the World!!" #329 "Until Our Ba Runs Out!" #331 "The Light of the Soul!" #332 "The Stone Slabs of the Modern World!" #333 "In the Name of the Pharaoh"
#335 "White Dragon, Black Magician"
#336 "He Who Inherits the Light"
#338 "The Rite of the Duel!!" #340 "The Ties That Bind"
#341 "The Master of Servants"
#343 "The Journey of the King"
This page was last edited on 18 January 2019, at 21:40.